After months of social media stalking I finally got the chance to meet Megan last year at the Spice Goddess event and had the pleasure of being hosted at her home this past weekend for her Mother’s Day Lunch With A Twist . 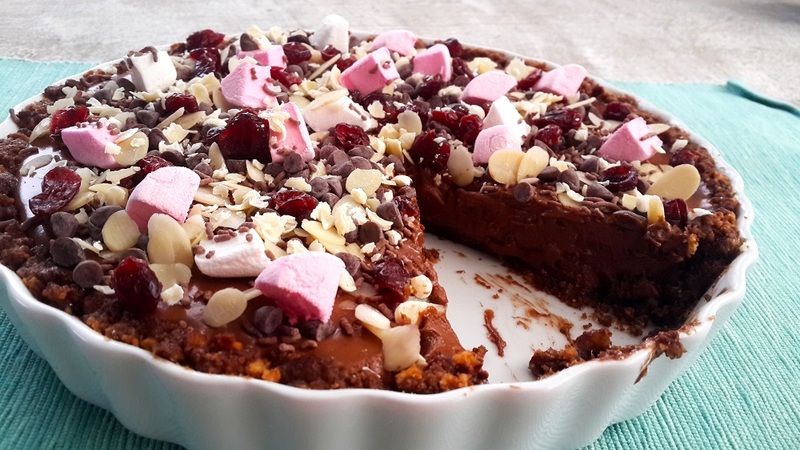 Megan’s blog is an index for all things delicious to cook and she has shared with us her recipe for Rocky Road Chocolate Mousse Tart. Hold on to your spoons, because things are about to get delectable! Life’s too short, so make sure you eat dessert first! There is no doubt that life can be challenging; whether it be bad traffic, a bad day in the office, an argument, financial woes or health complications. Despite all of these things there are elements of our lives that help us get through those moments, and in my mind no matter how small they are, they are greater than any problem and help make tough times sweeter. 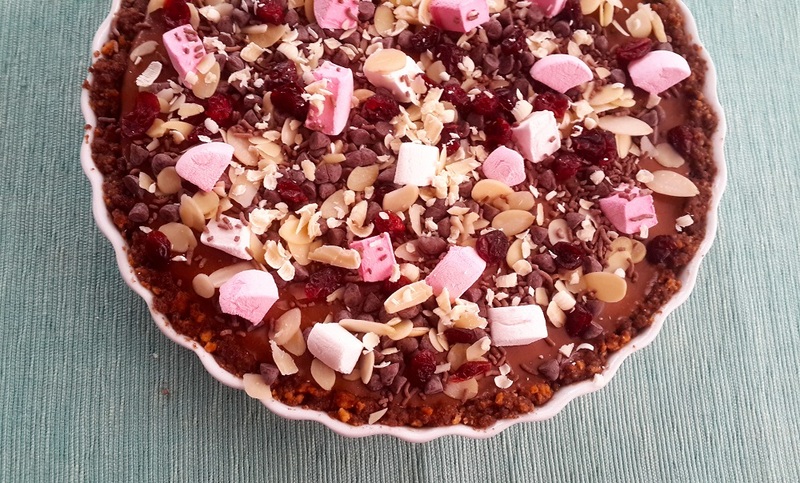 This Rocky Road Chocolate Mousse Tart is a little reminder from me, to look at the blessings in your life and indulge in whatever makes your soul happy. Crush the Romany Cream biscuits. Melt the butter and mix in a little at a time with the crushed biscuits. Note: You want the mixture to be sticky but not too oily. Press biscuit mixture in tart dish. Bake in a preheated oven 180® for 5 minutes. Leave out to cool down; once the tart dish has cooled down place in the fridge. In a bowl, whip the cream until at stiff peak stage. Set aside. In a separate bowl, beat the eggs and then add the castor sugar. Beat until light, fluffy and doubled. Add cocoa powder, continue to beat. Gradually pour in the cooled down melted chocolate into the egg mixture while continuously beating. Once the melted chocolate has been added to the egg mixture, take the whipped cream and fold into egg mixture. Once the whipped cream and egg mixture have been mixed and folded in, pour over the biscuit base into the tart dish. 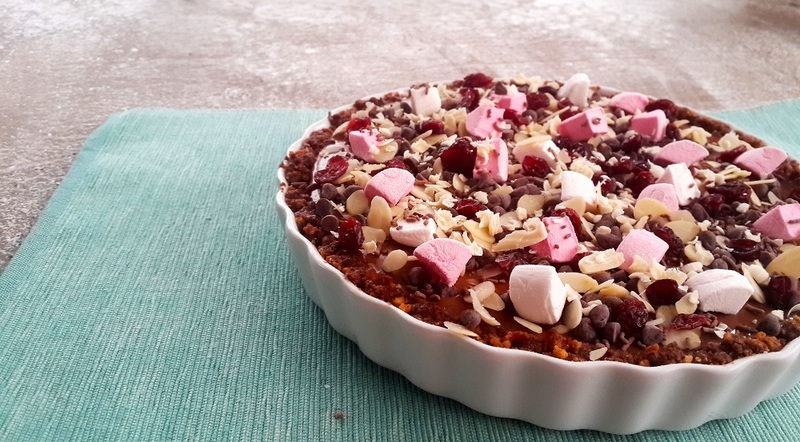 Once the tart is set, decorate it with the rocky road topping ingredients. Thank you to Megan for this awesome recipe! This may just end up being a firm favourite.